In short, it’s a bacterial bloom. However it is not the beneficial bacteria normally referred to as nitrifying bacteria. Before those get to work, another set of bacteria is needed. These “scavengers” are heterotrophic bacteria, which feed off organic waste in the fish tank. 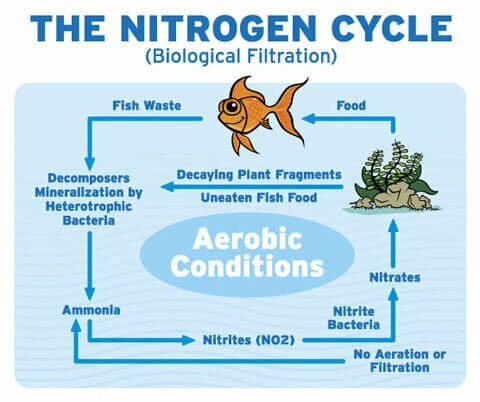 This feeding process represents the first stage of the aquarium’s natural nitrogen cycle, at which organic waste is converted into ammonia. The nitrifying bacteria on the other hand continue the process by breaking down ammonia into nitrites, and nitrites into nitrates, completing the nitrogen cycle. Heterotrophic bacteria can double in population every 20 minutes. Its growth depends on available organic waste in the aquarium. In other words, everything that decays in the fish tanks represents a food source for these scavengers. This excessive growth turns the aquarium water cloudy. How do I clear cloudy aquarium water? As a first course of action the gravel should be vacuumed using an aquarium siphon. This is where most organic waste accumulates and also where the scavenger bacteria initially grow. If large decorative ornaments are in the fish tank it’s a good idea to move these from time to time in order to vacuum the gravel underneath. The goal is to remove as much accumulated waste from the gravel as possible. Reduce feeding. Most organic waste introduced into the fish tank is from fish food. Overfeeding is common and probably the main cause for cloudy water problems. Do not perform large water changes. While the intentions may be good, large water changes can severely affect the balance of the aquarium leading to a further deterioration of the water quality. Consider your fish population. A severely overstocked aquarium will result in excess waste. 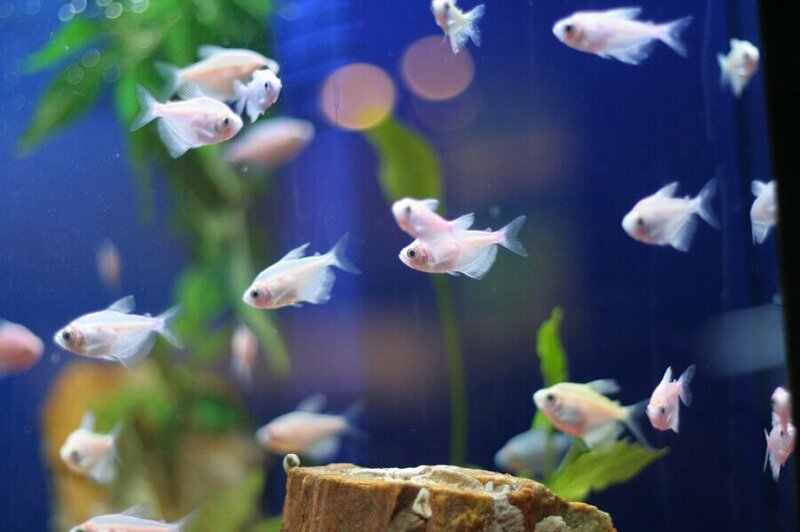 The general rule of thumb is not to exceed 1 inch of fish per 2 gallons of aquarium water. Be patient. Taking any or all of the above actions is a step in the right direction. However, the fish tank will need time to balance and recover once favorable conditions are created. 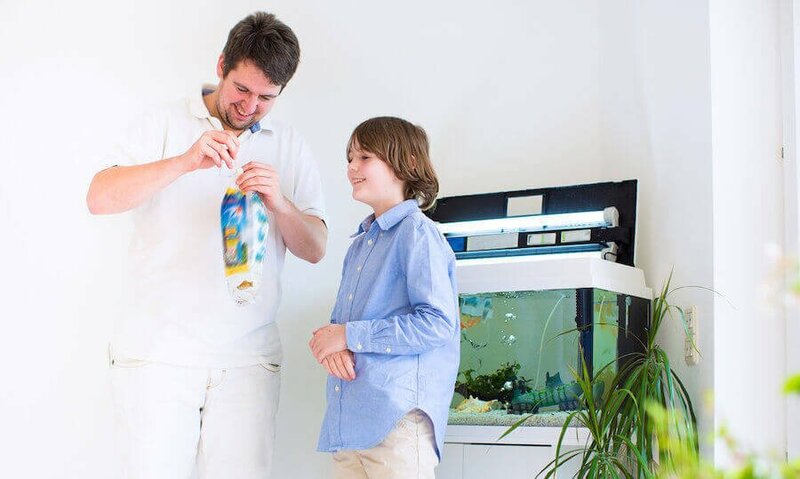 Also see our ‘Aquarium Maintenance and Fish Care Tips‘. 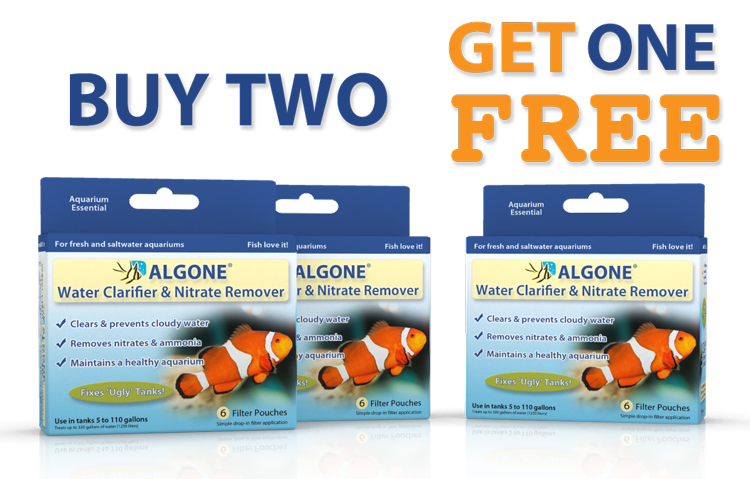 And make sure you check out Algone for clearing cloudy water and removing nitrates and impurities from the aquarium. Can I add this to my filter along with the other necessary products? I have an AquaClear 50 in a 29 gallon tank. Can I put it to the side or on top of other filters? Foam, carbon and Biomax? Yes, you can add Algone without the need to remove other media. Either stack the Algone pouch with other media you are running, or simply drop it into the filter box hanging off the back of the aquarium. A water test will give you the best answer. Test for pH and kH and make sure it is suitable for the aquarium. I have a male flowerhorn about 4 months. Aquarium water slightly turned green. So changing 25% water alternative days. Still the water is not Cristal clear. How many days it takes & Algone is safe for flowerhorn? Algone is safe to use, no issues. The duration is depending on the overall circumstances (stocking, feeding, maintenance) it can take a few days or a few weeks. I got my fish tank about 3-4 days ago and left the filter on like instructed. The water was crystal clear and I was proud of my new purchase. I woke this morning to see a white cloudy, murky kind of water. I did dechlorinate it as well PLEASE HELP!!! No need to panic. The white cloudiness is likely a bacterial bloom. Nitrifying bacteria need to establish in a new aquarium and the water my become a cloudy white in the initial stages. This should clear up on its own. Avoid aggressively large and frequent water changes believing you are solving the problem. This will only lead to a prolonged period of biological imbalance. Slow, incremental changes are key to aquarium success. 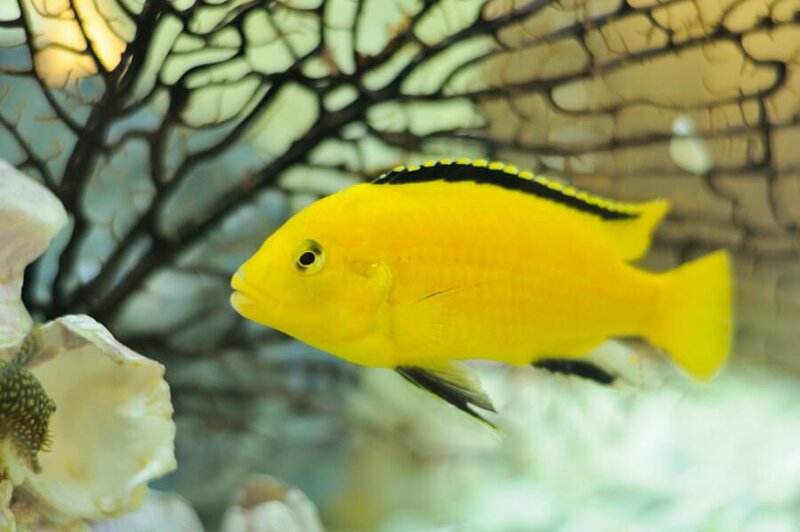 Feed only once daily, sparingly and don’t overcrowd the aquarium with fish, and things should clear up on its own. This sounds like it may be a bacterial bloom since it’s a gray cloudiness. 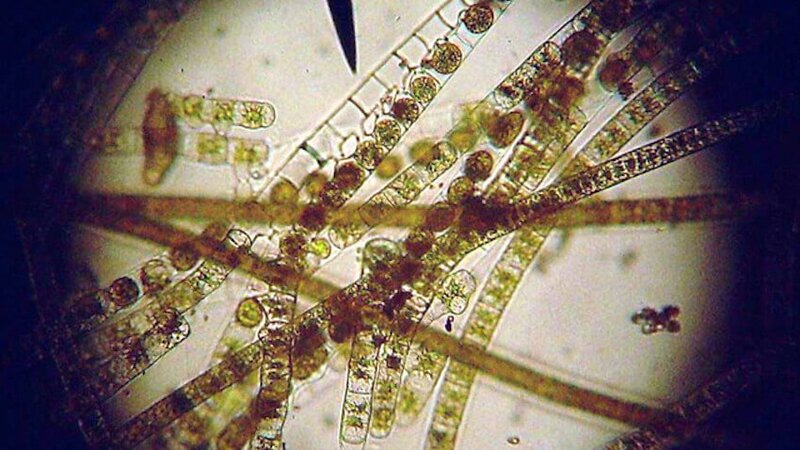 Read more about bacterial blooms in aquariums here. Also be sure not to overfeed. We recommend feeding your fish no more then once a day, sparingly at that. 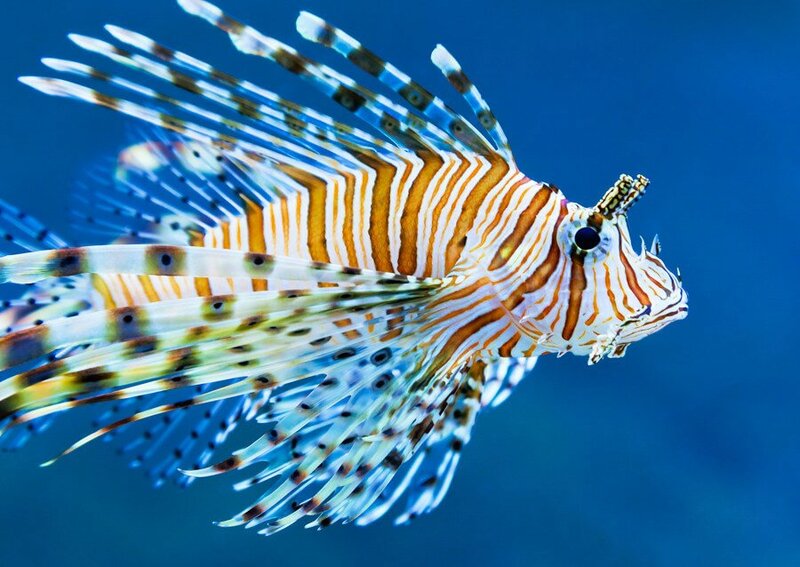 Most all aquarium problems stem from accumulating organic waste, which comes almost exclusively from fish food. Hi ,in regards,feeding once a day,,including fry,,living in the same tank,,just once a day?,,,,I have also heard leaving light on too much can make water cloudy,,,true or false?,,,,Thank you. Hi, I have had my betta fish for about a month now and his tank has gotten very very foggy. I need help! My bowl is about a 2.5 gallon. I think I might have been over feeding him a little but now I have stopped over feeding him so Idk what to do! You can change about 15 – 20 percent of water, while siphoning waste from the substrate, every few days to help clear the water. You said you cut back feeding, you might want to consider feeding sparingly only once every other day. A 2.5 gallon aquarium of water will quickly pollute and turn cloudy or experience green water / algae outbreak, compared to a larger tank. 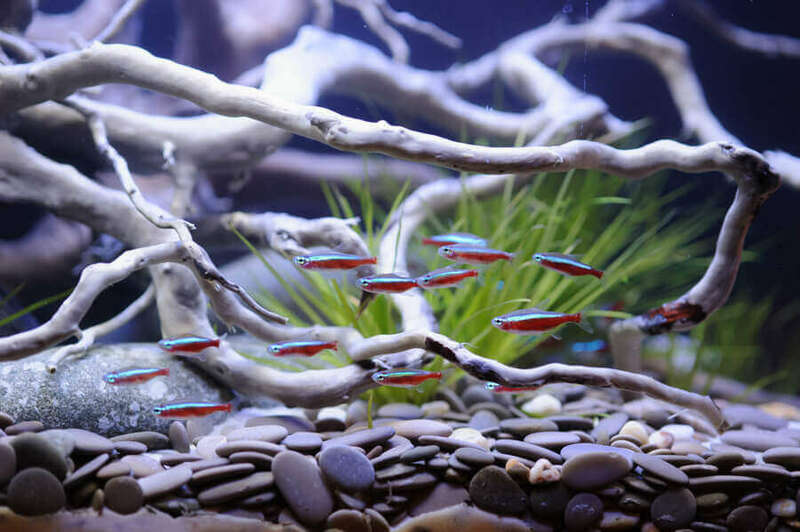 Read more about the challenges of small aquariums here. Give Algone a try. 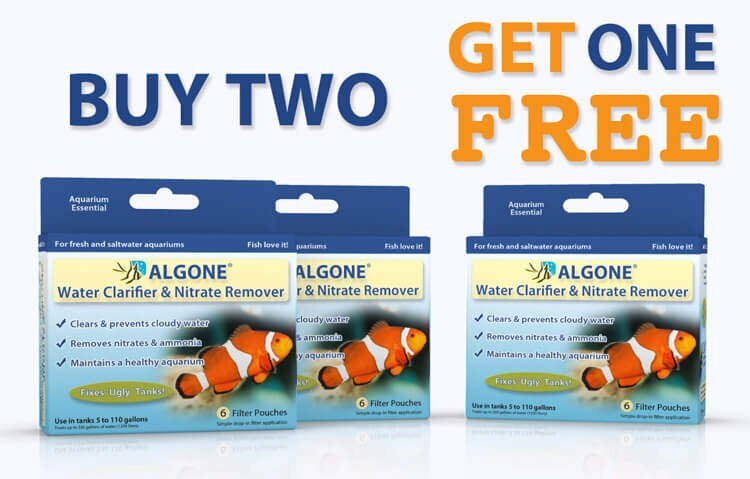 Algone balances the aquarium water, removes nitrates, and polishes the water crystal clear. Learn more about Algone here. Yes it does have an expiration date, but it is not uncommon for some conditioners to smell. Generally fine to use within 3-5 years. Refer to the manufacturer for details. You cleaned away the bacteria that make the water safe for the fish. There are several species of bacteria, heterotrophic bacteria break down organic waste, and the beneficial bacteria oxydize waste into ammonia/ nitrite/ nitrate. The bacteria settle anywhere in the aquarium. Cleaning too thoroughly literally wipes them out. Especially the heterothrophic bacteria. These then re-populate the aquarium and that is what turns your water cloudy. You might have enough survivors on the beneficial bacteria, but watch for ammonia. I have 2 Oscars that are about 3 yrs old…one black and one goldfish orange..I have them in a 65 gallon tank.is this the right size of tank for their growth? 65 Gallons would be on the very low end having two Oscars. These are big fish and need some room to swim around freely without bumping into walls or tank mates. I have an aquarium size of 36×18×24 (l×b×h). I have got oscars and 4 tinfoil. These are not so big. The water is cloudy. How do I keep it clear? And I use the food tidbits. That would be about 65 Gallons … your aquarium is too small for the fish you are keeping. Oscars and tinfoil barbs easily grow to 12-15 inches. 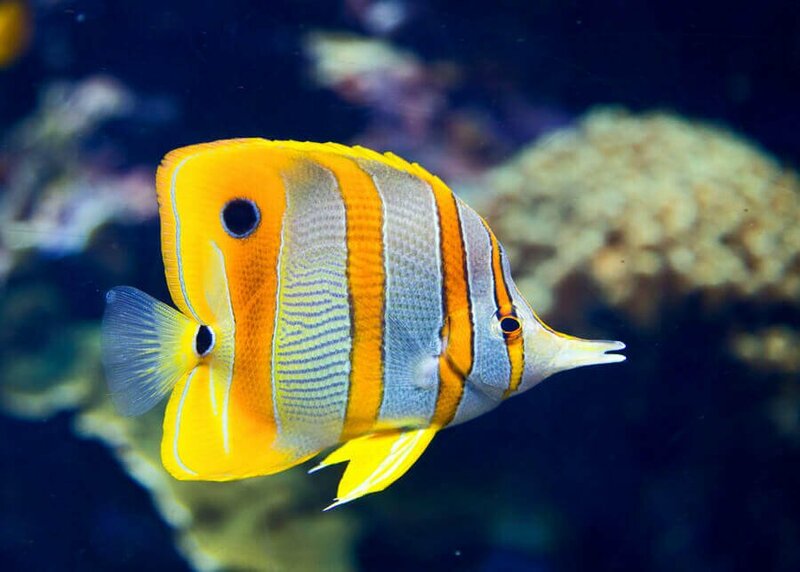 Your aquarium will not be able to sustain these fish and more problems are likely to ensue. 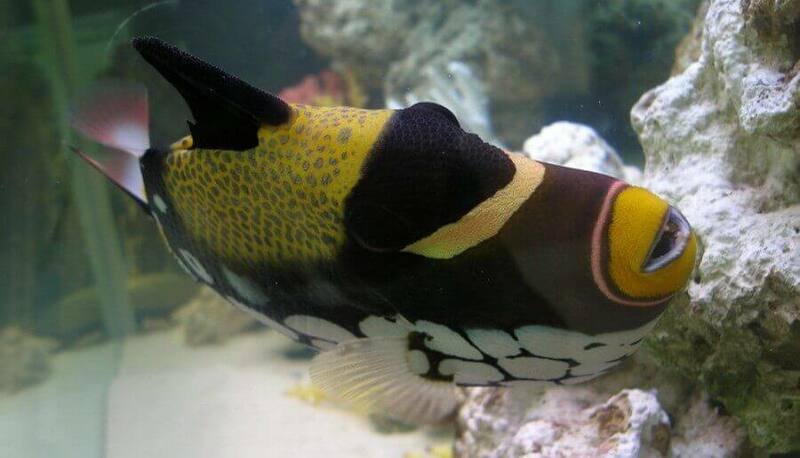 The best advice is to get a larger aquarium, or more suitable fish for your aquarium. My water is extremely white and gree cloudy.I have multiple fish and variety. Some are dying. I’ve tried water changes clarifyers nitrate and nitrite mediums but the water has a greenish tint to it now. What can I do to clean the water? I started with well softened water but have used bottled water for changes. At least 20 gallons in a 20 gallon tank. It just gets worse. Green water is caused by excess waste and influenced by many factors. So is the white discoloration. Overstocking, overfeeding, wrong environment, plants not doing well, substrate, filtration, light, there is an endless list of possibilities. Please contact customer service with more details on your situation. Hi! I’ve learn so much from the A/Q, thanks! I just set up a 25 gallon planted fresh water tank. Water pH was 8.2 so I used neutral buffer and it become super cloudy. My filter is whisper 30i it has been 2 days and no changes in the water color. What should I do? ive just put the water in the tank and its really cloudy from the gravel should i put the filter on to speed up the process. Yes, run the filter. It’s quite normal for the tank to initially be cloudy due to free floating particles from the gravel. How long til it clears I did the same think .I washed the rock first ,filled up the 29 gallon, very cloudy .I syphoned about 40%water n rock then added new water .Should it be clear in a few days ? The aquarium should clear in only a day or two with the filter running. If it doesn’t, the cloudy water is likely not just particles from the substrate.